The Super Albatross wings are stored along the wall of the building and can be viewed from the nose of the sailplane. A close-up inspection of the upper surface of the wings will reveal what we see photographically below. There are four slot type devices known as “spoilers” on top of each wing. When a control is activated in the cockpit the spoilers are deployed and in this case look as follows. These plates come up out of their slots in the wing when the spoilers are deployed. They disrupt the smooth flow of air over the top of the wing resulting in a decrease in the lift which causes the sailplane to lose altitude. A sailplane gliding at 60 mph and a shallow 150 fpm down may result in a 40:1 ratio (airplane loses 1 foot for every 40 feet it moves forward). With the spoilers extended this ratio may result in the aircraft dropping at 1500 fpm or a 4:1 ratio of four feet forward for every one foot down. 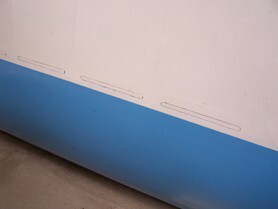 Some designers use a hinged surface of their spoiler “doors” as shown below. This is enough to overcome any vertical currents that may be rising in the atmosphere and permit the pilot to land exactly where desired on the airfield. On final approach to landing, it is desirable for the pilot to be able to lose altitude without resulting in an increase in airspeed. This is what spoilers do. Still, other designers make use of spoilers on both the top and the bottom of the wing surfaces. As you continue your tour of the museum look closely at the wings of the various sailplanes to see if you can spot these spoiler devices. They are not always easy to see because they are in the retracted or “stowed” position when not being used.